Polk Township is a residential / farming community located in northern Jefferson County, Pennsylvania. Covering 30.7 square miles of land with a population of just under 300 people, Polk Township has a lot to offer. Its close proximity to State Parks, State Forests, State Game Lands, and the Allegheny National Forest, make Polk Township an attractive community in which to live and enjoy the great outdoors. 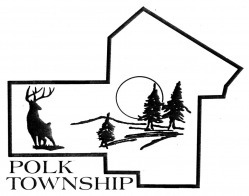 Polk Township offers it's residents an exceptional level of service with emergency medical services, a highly trained local volunteer fire company, and a full service Country Store. These services, complimented with a variety of recreation opportunities for hunting, fishing, hiking and youth activities make Polk Township an excellent place to raise a family. Polk Township is located within the Brockway Area School District.